What Are The Dangers Of Moving Firewood For Camping? For most people, camping out brings to mind sitting around a campfire, cooking, sharing stories, or laughing together. A campfire can be the cozy hearth that friends and family gather around at the end of a busy day enjoying nature. 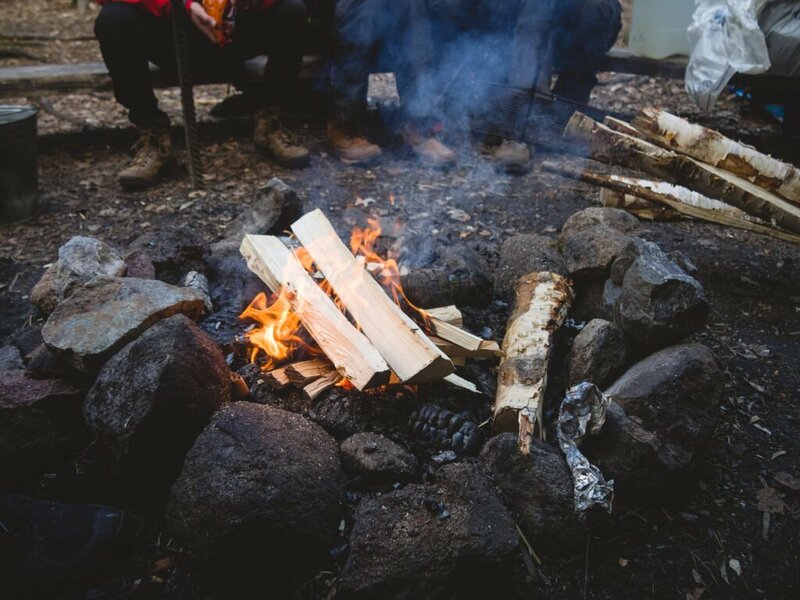 If you’re like many people who enjoy camping, you might not think much of grabbing some wood that Uncle Bob cut from his property and take it with you as you head out of town. After all, it is free and already cut! Many of us grew up hauling firewood to our campsites. It turns out that this common practice has put some of our forests at risk (or even under active attack) by non-native insects and diseases. These unwanted pests can be transported from regions where they are common to areas that have not been exposed through firewood. Once in a new location, these devastating species can become established in a forest and kill large numbers of trees and vegetation quickly. Pests like the emerald ash borer, gypsy moth, Asian longhorned beetle, and Rocky Mountain pine beetle can move pretty far on their own; but when they are in firewood, they can be transported hundreds of miles to infest new forests. Trees have evolved over time to survive with some local insects and diseases, and natural predators have developed to control populations of these native pests. When non-native species, which are not normally found in a particular area, take hold, the forests have few natural defenses which can allow these introduced pests to become invasive quickly. The result can be disastrous—destroying forests, increasing wildfire danger, decreasing property values, and costing time and resources to control. Even wood that does not have any visible indications of being infested can carry eggs or spore of pests that could be problematic. Some states have quarantines in place to prevent moving firewood out of a particular area. The rule of thumb is the shorter distance from where the wood was harvested to where you intend to use it, the better. On the same thought, don’t be tempted to take left-over firewood home with you, as you may be introducing problem pests to your own area. State-by-state information for requirements, guidelines, and quarantines for firewood can be found at Don’t Move Firewood. Firewood Scout is a growing resource that can show local wood vendors in specific areas where you may be traveling. Using local wood makes a lot of sense..You. aren’t using needed space in your rig, and there is no mess. I know, I know, you have lots of aged, cut up wood from your property. Well, use it in that fireplace or fire pit at home. We are very familiar with the Summit County Colorado area. Thirty years ago there were beautiful trees that looked like a carpet. The in the fall our beautiful Aspen trees would change to gold. It looked like Got had thrown buckets of gold up the hills. The Aspen still show up thank goodness. Visit Colorado and respect the environment. We travel extensively and see signs of dying trees across the country. Do what you can to help keep our country beautiful. See ya on the road. Emerald ash borer has pretty much spread to the entire Midwest. I don’t believe bringing my own firewood will spread the disease, since it’s already widespread in the areas I camp. I do, however, buy firewood locally because I think it helps support local industry. They’ve not yet made it out to the Black Hills of SD. And believe me, after our disaster with the pine beetles we must certainly don’t want the ash trees to get hit as well. Burn it where you got it PLEASE. After all the world is not all about you. I buy wood for 5 bux a trailer load, not 5 bux for 5 stix. I split my wood, spray it with bug killer and stack it for use thru the summer. I load a tote for each night I’ll be out, and place it in the compartment of my motorhome. No bugs that I have ever seen. Ok, I’ll play. Please name 15 places where this has occurred. Ok, just name one. And now show me the evidence that the firewood was to blame. For your scenario to occur, a sequence of several miracles has to occur. First and foremost, my wood must be infected. Those critters in my wood must survive the wood being dead and aged for a year or three. They must survive my bug spray. They must arrive in an area where they do not already live. They must choose to abandon what must be a cozy little nest before I light them on fire. They must possess the capability and will to cause damage to the local area. The local area must have something these critters can damage. The wood being sold locally must be from the local area, not brought in by the Ace Hardware truck. No, I think I’ll just keep doing what always has worked. But thanks for trying to scare us all with your wild unsupported hypothesis. Next your gonna tell me the earth is heating up, or cooling, and we’re all gonna die. So why worry about the critters in my wood. You guys make no logical sense. I think Bill Engvall said it best. Here’s your sign. I’m with you on global warning and all the rest, however the invasive species that are here have moved quickly and it is provable. No predators to manage them. A few things – the snakes in Florida, the invasive vine called kudzoo (don’t know how to spell it, just saw it covering everything in its path) the bugs in the article. So – your bug spray may kill some, but the rest will destroy. Think of what your kids, my kids will not enjoy that you take for granted. the thing that really gets me is that we you “buy locally” even from the parks themselves, its $5-7 bucks for a bundle – about a buck a stick. make it worthwhile for me to leave mine at home and I will. It’s illegal in Maine if they catch you bringing in wood from another state they will take it away from you and fine you. Keep your bugs where you live. Tony Mac, the spread of pests in an already infested area is of course, not a spread. That said, perhaps measures have been put in place in areas that once harbored these pests and have now been placed under control or even eliminated. And here you bring in your “treated” firewood and potentially start the process all over again. As for the author’s “unsupported hypothesis” scare, please preach and convince that to those of us who camped under the once majestic old coast live oak stands that graced parts of Southern California that have been turned into dead zones due to the introduction of the Arizona Goldspotted Oak Borer, most likely carried in by a camper. I asked for one place where this has occurred, and you supplied it. THIS is information, not just blind directive from on high. A searched it and have found what i need to do some further research and rational thinking on the subject. I’d like to hear more examples of it. 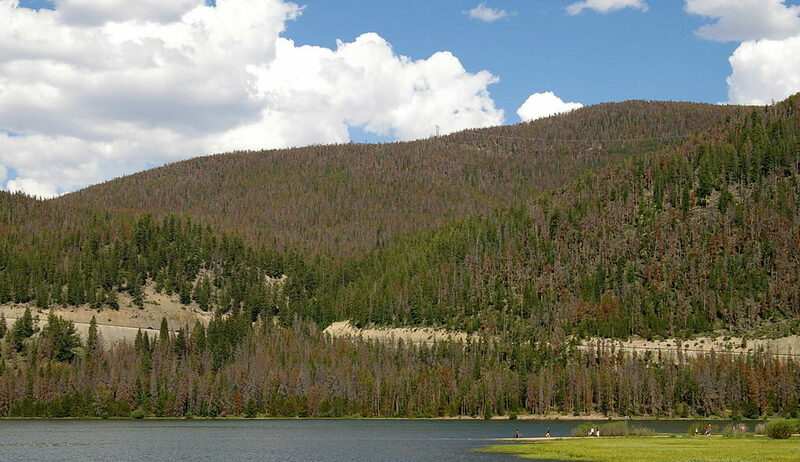 1 in 6 pine trees in Colorado are standing dead because of non-native beetles. While you can’t say with 100% certainty it was firewood carried in from other areas, you can say for certain it COULD be the cause, and that should be enough to make a responsible camper with even average intelligence not want to do it. Who is to say that humans caused this with our firewood? I personally believe that these beedle infestations are probably part of the overall ‘master plan’ of the earth. In other words…part of the earth’s natural evolution. And once again…man has decided that it is up to us to mess with things…again! Bring lump charcoal, make a “nest” of it in the fire ring, & purchase 1 bundle of firewood from the camp store. That’s enough wood for 2 nights of flames; as the flames burn out, the charcoal will cook food & roast marshmallows. This saves $$, and doesn’t introduce non-native species. One important thing not mentioned here is if you do use wood from home, age it for a year, split it and knock the bark off. If you do that, there is almost no chance you will transport pests. Most if not all pests live under the bark in green wood. If the bark is off and the wood is dry, the pests are gone. Michael, the term pest can also include harmful fungi and bacteria, not only creepy crawlies we can see. True, However, the fungal and bacterial parasites I am aware of that are damaging our forests (and citrus and fruit orchards) today are almost exclusively carried by infected insects. Dry seasoned firewood that had no bark on it is highly unlikely to be a carrier of insects harboring fungal and bacterial diseases or parasite. Just saying. When I process my firewood at home, I know exactly what has been done to it to prevent carrying forest pathogens. Buying local firewood (from a roadside stand for instance) that is improperly prepared to rid it of harmful insects and forest pathogens may actually be worse than carrying your own that is debarked and thoroughly dried and seasoned. I am a biologist and this is just my opinion based on my travels and personal experience..
Michael, you may be one of the rarer campers out there that actually processes their firewood in a matter that will minimize or even eliminate pests and pathogens. It is true that many pathogens are vector borne, but the average Joe makes a wood pile that may sit and molder for who knows how many seasons, all the while harboring pests of a broad spectrum. I’m fortunate — some may say unfortunate — that there’s a building boom in my area with quite a few new home communities popping up. I periodically scour these for lumber scraps, and have built up quite an impressive pile of processed fuel! I work in a lumber mill, I can get a pickup load of boards that have been kiln dryed, but are too twisted to go through the planer. All bugs and fungus spores are dead after 48 hours in the dry kiln. On another note green lumber is shipped from coast to coast and across boarders from Mexico and Canada. A lot of construction lumber is shipped and built with gree. The bugs can just as easy jump off a flat bed truck or a rail car as out of the bead of your pickup. I think it is more of a money making thing than any thing else. Why should we pay $950.00 a cord at a camp ground. I would love it if wood at a camp ground was a reasonable cost. Camp ground wood is over priced.